Mamma Mia starts off the new year strong with new technology like the projector shown in the following image. The lights shine, the projector beams, the music starts and the mic drops, that’s right, Mamma Mia! is here. The James Bowie theatre is hard at work, especially the tech crew, who manages the behind the scenes. Senior, Ben Harmon, who is responsible for the projector shares the new technology Bowie will be using during their hot Broadway show this week and next week. “The projectors job is to play animations that the projection team designed and animated to really make the big musical numbers in the show really pop and bring out all those classic 1980s ABBA vibes,” Harmon said. The projector is the behemoth of wires and gizmos that the tech crew names Speedwagon. The Speedwagon play an important role in the show. In addition to the projectors, the tech crew has also implemented the turntables into Mamma Mia! 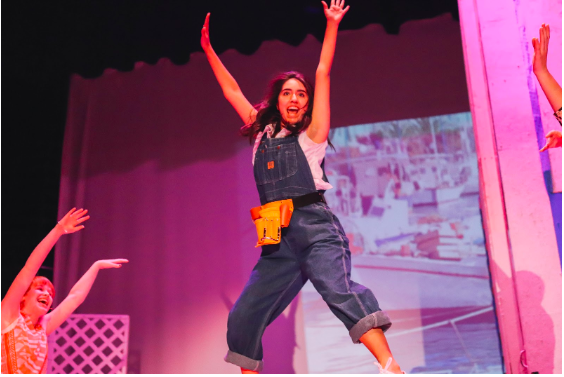 “The turntables are used to differentiate the settings that the characters are in, so we have one side of the turntables that are based on greek buildings and we use them for the outdoor and beach scenes,” Master Carpenter senior Matthew Bosnyak said. The turntables are used in multifunctions and help make the Mamma Mia! show come alive. “The other side of the turntables are indoor and the main turntable is supposed to represent the “taverna” in Mamma Mia!, so they rotate based of the setting of the scene,” Bosnyak said. To better display Mamma Mia!, the tech theatre students have also made a disco floor. “The dance floor gives the music and lights another element, technicians programmed the cues so that the floor could light up for certain songs like Dancing Queen,” Bosnyak said. With the collaboration of many people, Mamma Mia!has finally come together. “I think the addition of projections for these certain numbers are what really makes our show stand out,” Harmon said.